Skilled nursing services include acute care, long-term care, care management, assessment, education, rehabilitation, geriatric and hospice. Rehabilitation Services include physical therapy, occupational therapy and speech therapy as well as nutritional counseling. Click here for a directory of our rehab professionals. Medical social work services include assessment, counseling for families and patients, and community resource planning. Support services include home health aides, homemakers, companions, respite care providers, private duty nurses, volunteers, meal preparation and light housekeeping. Community services include support groups, heath screenings, senior clinics, educational and wellness programs, flu immunization clinics, workplace wellness programs, school nursing and pre-school health services. 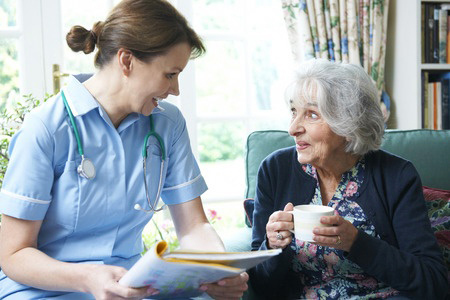 A Home health aide assists a person when the help required includes personal care such as bathing, dressing and exercising. This service, which may include light housekeeping and meal preparation, is available from one to 24 hours a day. All aides are certified. Live-in aides are also available. A Homemaker is most often used when basic light cleaning is required for the patient’s living quarters. For persons who are not able to be left alone safely, a companion will provide socialization, safe-guarding, meal preparation and some light housekeeping, but is not permitted to provide personal care. This service is available from one to 24 hours a day. Volunteers are an integral part of the care team. Volunteers are available to provide emotional support to the patient and/or family, provide transportation to medical appointments, do grocery shopping, pick up prescriptions at the pharmacy, etc. Volunteers are fully trained and supervised by our Volunteer Coordinator.